Founded by lawyers and educators who graduated from Ivy League universities and top graduate schools, English Hound offers custom-designed classes to advance your child’s reading and writing skills. 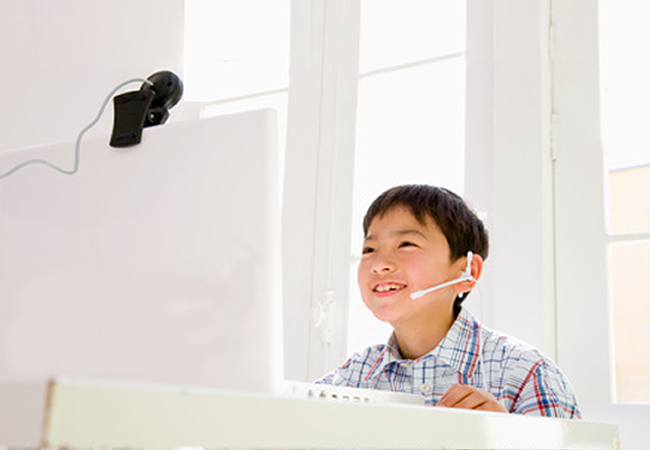 We offer one-on-one or one-on-two online tutoring sessions with an English Hound teacher via video conferencing. Selected after a rigorous screening process, our teachers are well-credentialed, experienced, and great with students. Come explore our website, take our online classes, and set your child on a path to a brighter future. English Hound cultivates excellence in reading and writing by helping students develop confidence, critical thinking, and effective English communication skills. It says a lot about English Hound's commitment to education that the Founder/CEO personally conducts a rigorous screening process to find the most qualified teachers. What is special about English Hound is that it individualizes lessons to fit the abilities of exceptional students who are many years ahead of their grade. It is well respected among our circle of well-educated friends who value learning. And the bonus is that it can be done at home! Mary helped my daughter expand her vocabulary. After getting to know my daughter's level, Mary came up with a selection of words that are adequately challenging for the online session. My daughter enjoyed studying the vocabulary building class with Mary. She told me that she learned a lot not only what the words mean but also how to use them in sentences to convey exact ideas. I suppose that this came from Mary's long experience in teaching middle school students as well as from her excellent educational skills. At first, I did not appreciate effectiveness of online education. But we are satisfied with the tutoring service by Englishhound.com and will use more for enhancing my kids' education. English Hound is such a wonderful program for children learning to read. It uses the renowned Houghton Mifflin Harcourt's digital reading curriculum that is aligned with the Common Core objectives. It's also convenient because my son can do the lessons while I cook dinner! This is a great supplemental educational tool for children. I especially liked the one on one tutoring approach. Mary Trask was engaging while she was teaching with fun games and exercises. After an hour, my son said, "Wow, it felt like 5 minutes!". The writing teachers at English Hound are top notch. Not only did the teacher teach my 6th grade son how to organize and revise his writing, the teacher taught him to think critically about his arguments and to write them convincingly. My son also thought the teacher was smart, engaging, and funny. English Hound’s online class is very convenient and easy to schedule. Where else can you get individualized tutoring in the convenience of your own home at a time of your choosing? It’s perfect for the busy household. The session, via easy to use Skype, commenced with a very friendly and welcoming tutor to whom my daughter immediately warmed up. The lesson consisted of reading comprehension, vocabulary, and composition. I was impressed with the quality of instruction and the fact that it was highly tailored to my daughter’s responses. She found the teacher easy to understand and quite approachable. She was even willing to pursue further lessons! English Hound is truly a value proposition — excellent quality teaching with a convenience that’s ideal for the modern household. Highly recommended! My 10 year old son took a reading and a writing class offered by English Hound. While both classes were great, the writing class in particular was extremely helpful as writing is relatively a weaker area for my son. As a straight A student, just like a lot of Korean students in the U.S, he always has done well in school across all subjects. As much as I’m pleased with his excellent academic achievement in school, I think kids in most public schools are measured by lower standards, although school districts vary in their standards. I bet there are many parents who feel the same way as I do walking out of the teacher-parent conference thinking, “When the teacher said my son is doing excellent, what does it truly mean? Does it just mean that he is exceeding the ‘minimum’ standards set for the average 5th graders?” As a non-native speaker of English, I find it difficult to teach him English at home relative to other subjects including math. English Hound has teachers with excellent credentials and extensive teaching experience. These teachers taught my son online and found out his strengths and weaknesses instantly and structured the class accordingly. Another great thing about English Hound’s classes is parents’ participation. Unlike after school academies and hagwons, parents can watch the live class sitting right next to their child. It allows them to provide feedback to the teacher, which I believe is the most effective way to improve the quality of the education that their child is getting. For anyone who wants to enrich your child’s English in both reading and writing beyond what is taught at school, classes offered by English Hound caters to your child’s specific needs and so it is highly recommended. Our son was born and raised in the U.S. where he finished 1st grade. In September of 2014, our family moved back to Korea and we enrolled him at a local Korean elementary school. We hoped that our son would have opportunities to maintain and maybe even improve his English skills. But as we do not live near a metropolitan area, we were disheartened to discover that not only was it difficult to find native speaking teachers, but to find quality English lessons that fit my son’s English level was not possible. That was when we came across English Hound Program and had an opportunity to experience a trial class via Skype. Because I had preconceived notions that English is best learned though direct meeting and conversation with a teacher, I was a bit skeptical at first. Especially being a boy, I had doubts about my child’s ability to sit still in front of a computer for an hour as well as strong reservations about how focused he would be. These apprehensions were eliminated in less than a minute into the lesson. The trial class was a vocabulary class by Teacher Mary. She introduced new vocabulary words with pictures and descriptions in a way that not only sparked my son’s interest, but drew out active participation all the while continuing the thread of conversation. She introduced etymology and encouraged him to think about other words that might derive from those that he learned. This was a higher level of English learning that was a departure from conventional teaching by rote. Also by encouraging him to practice the use of the vocabulary words in a sentence, she helped him put the words in his head and thus make them his own. After the hour lesson, my son spoke in English the whole day! This was especially surprising because ever since we returned to Korea, without additional English study, he had become so much more comfortable in Korean than English that he was starting to not use English. He also said he wants to do more English Hound lessons. I want to especially recommend English Hound to those children who, like my son, have returned to Korea after living in America. Through English Hound lessons, they will be able to learn from high quality teachers from America via Skype without having to travel, and I believe that they will not only be able to maintain but to improve their English ability even here in Korea. I helped Helen Whang found this company after discovering that our educational philosophies were closely aligned. We believe children are capable of learning so much more at a young age if they are immersed in an enriching environment filled with books, conversations with adults, and high expectations from parents. We think most schools do not do enough to cater to students who are far ahead of their grade. But English Hound does. My daughter, who will enter kindergarten this fall, and her friend, who is in kindergarten, read a Level O book, which most schools cover in 3rd grade, with their English Hound teacher. My son, a 2nd grader, took a 6th grade vocabulary class and not only learned the root of words but was able to practice using words in sentences. The classes are highly educational and, more importantly, my daughter and son really enjoy English Hound classes. They keep asking when they can do more! With a good English education, I hope my children are exposed to English naturally and consistently and would be able to use English as a means of communication in everyday life in this global age. I don’t want them to think of English as a difficult foreign language. With English Hound, students can use textbooks or popular reference books used in the US, and the students in Korea can have the experience of going to a school in the US. Also, my son and daughter found the online video classes fun and interesting. After taking 3-4 English Hound classes, my children are actively asking when they can have the next class. English Hound is better than hagwons because hagwons have 10 to 12 students in one class so students don’t get individual attention and the management of individual students is lacking. English Hound’s classes have 1:1 or 1:2 teacher student ratio so individual students will be more engaged in learning and lessons are tailored to suit their individual abilities. Also, unlike hagwon cramming sessions, English Hound uses interesting books used in the United States and reading these books interests my children and motivates them to learn. I think my children’s English will improve a lot with English Hound. Since my daughter Suyeon attends an international school in Korea, I think it is particularly important for her to learn with an experienced, well credentialed teacher in the United States. I feel extremely satisfied when I see Suyeon enjoying learning reading and writing from great teachers at English Hound. Another great thing about English Hound is that it fits into our daughter’s busy schedule.